There are thirty children in Class 5. All the first part of the summer term they had been doing a project collecting data about themselves and making all sorts of lists, charts and graphs to present it. Now it is June and they are going to present all they have done in the project to the whole school. There is double excitement in the classroom that day because it is also one of the children's birthdays. On what day did Class 5 present their work? Here are some more charts and posters made by Class 5 for their project. The pie chart shows the children's hair colour. 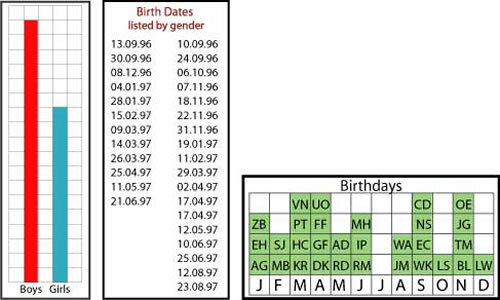 What information can you find out about the child whose birthday it was on project day? There are twins in this class. What information can you find out about them? Working systematically. Frequency tables and Bar Charts. Comparing data. Processing and representing data. Interpreting data. Selecting and using information. Collecting data.